Dual Intel Xeon E5-2670 server or workstation systems are fairly popular as the CPUs are quite cheap, but is it worth considering AMD’s newer Threadripper instead? 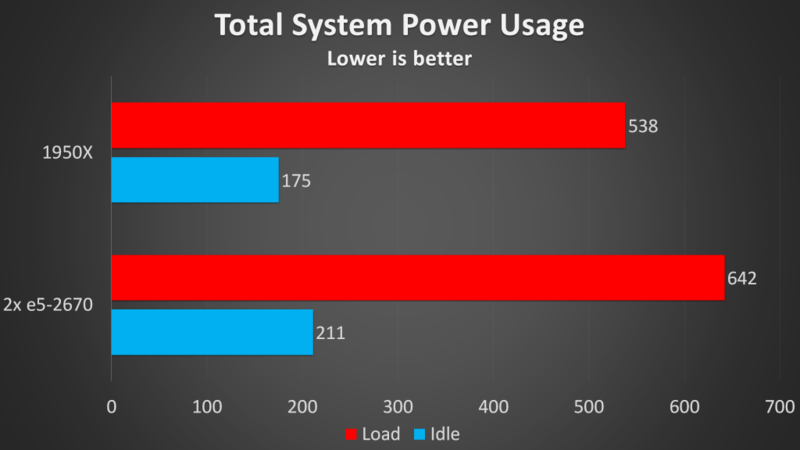 In these benchmarks I compare the differences in performance and power usage between the 1950X and two E5-2670 CPUs. I previously built a 16 CPU core server using two 8 core Intel E5-2670 Xeon CPUs, as these are fairly cheap and could be bought second hand for around $50 USD from Ebay when I picked mine up. I recently upgraded to an AMD 1950X Threadipper workstation which also has 16 CPU cores, and I was interested to see how it would compare. AMD Threadripper system on the left, Intel Xeon system on the right. The Xeons are from 2012 while the Threadripper CPU is from 2017, so 5 years difference between them. Both systems are running with 64GB of RAM, although the Threadripper system is running DDR4 at 2,666MHz, while the Xeon system is running DDR3 at 1,333MHz. Both systems are running Windows 10 pro for the operating system with all available updates installed. As I’m testing these from the perspective of being a productivity workstation, I haven’t included overclocking results for the 1950X or performed any gaming tests as they don’t really make sense here. Of course we expect the 1950X to win as it’s quite a bit newer, but by how much? And are the cheaper options still worth considering with all these new choices? Let’s take a look at the benchmarks and find out! 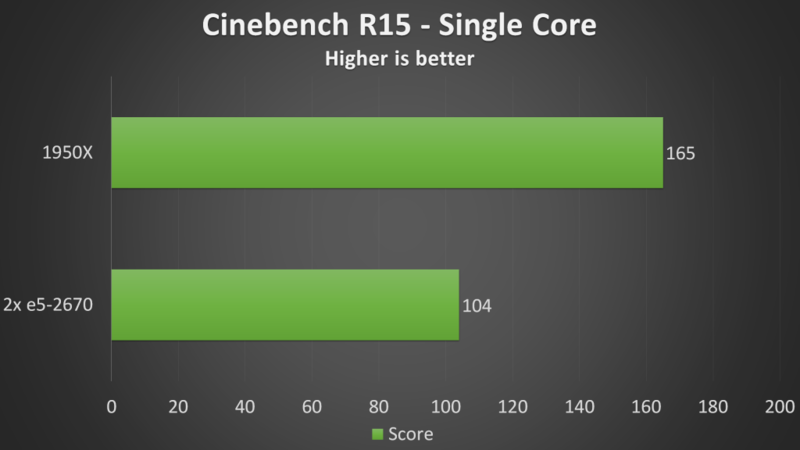 Starting with Cinebench we can see that in single core the 1950X is a fair amount in front. Although you can get much better single core performance with consumer grade Intel chips this was still important to test. The multicore results are where these two high core count systems shine, with the 1950X still a fair amount ahead of the Xeon system. 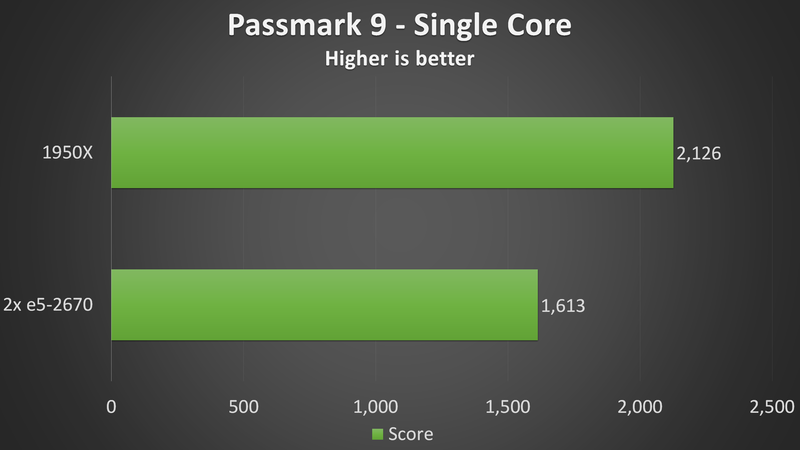 The Passmark 9 single core results show slightly less difference between the two. 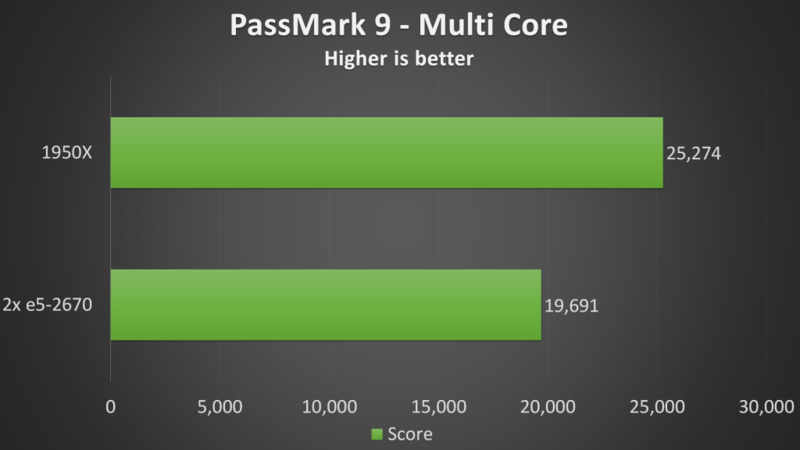 The multicore results tell a similar story around the 30% difference mark. Looking at the single core results in Geekbench 4 shows the 1950X doing much better when compared with the Cinebench test, over 70% better in the single core results. Swapping over to the multicore result brings things a little closer together though with just a 40% difference, so it would seem that something in this particular test favours the Threadripper chip for single core performance. 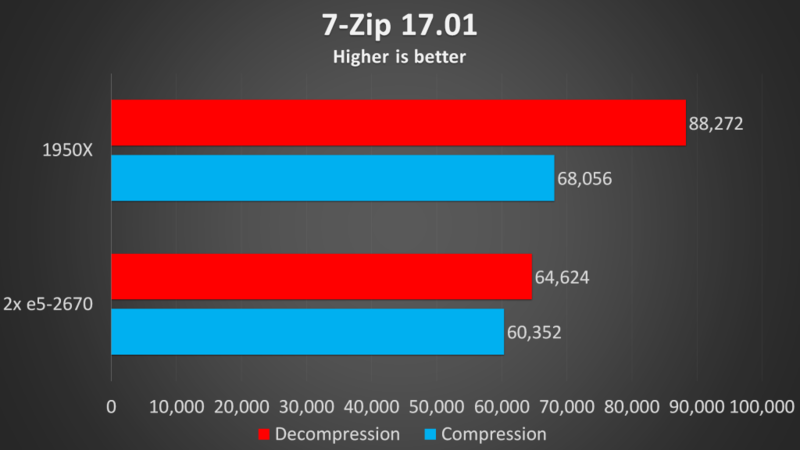 I’ve used the 7-Zip benchmark with a 32mb dictionary size to test compression and decompression, and we can see that the compression speeds aren’t actually that far apart, however the 1950X is quite far ahead when it comes to decompression tasks. 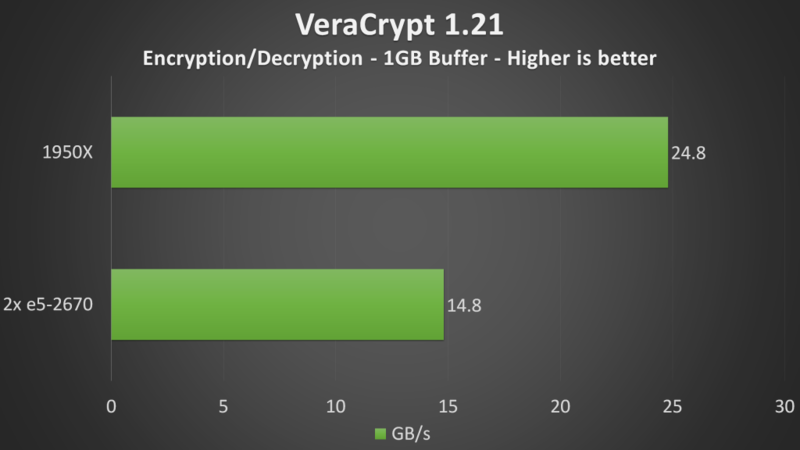 VeraCrypt was used to test encryption and decryption speeds. With a 1GB buffer size we can see that the 1950x is performing quite a lot faster than the two Xeon CPUs, around 67% better. 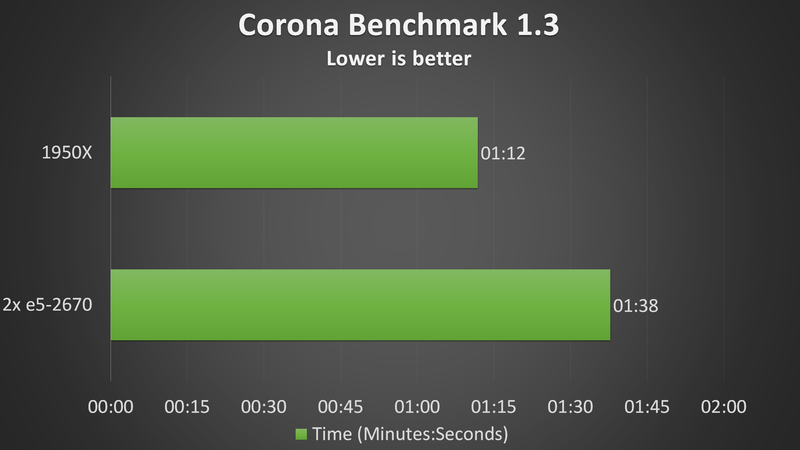 The Corona 1.3 benchmark renders a scene using CPU power only, in this test we can see that the 1950X completed the task faster, around 36% quicker, only less than half a minute faster. 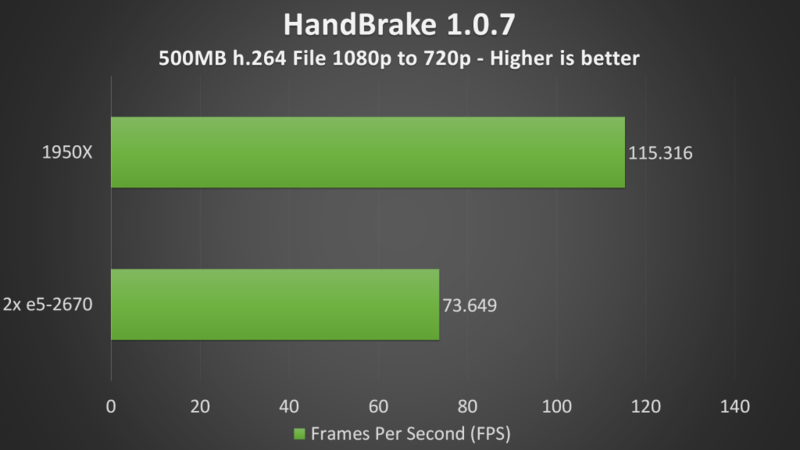 Now let’s take a look at some video encoding, with Handbrake I’ve encoded a 1080p h.264 video file to 720p, and we can see the 1950X was a fair bit faster. If you had a lot of footage over time it would add up to quite a big difference. In Adobe Premiere I’ve rendered a video which goes for around 10 minutes at 1080p. GPU acceleration was disabled for the test, these results are CPU tests only. 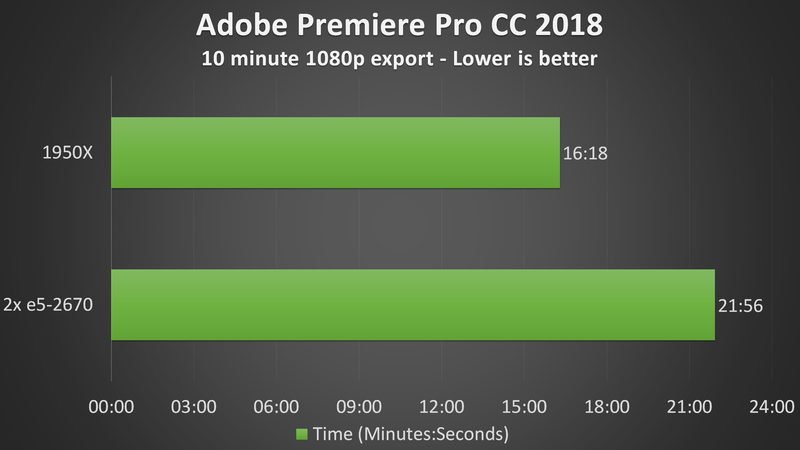 We can see that the 1950X completed the same task more than 5 minutes faster which is around 34% quicker, again this would start to add up if you did this regularly and would be even larger with 4K footage. From the results we can clearly see the 1950X is winning in every test as should be expected, it’s a 5 year newer CPU and is more expensive. On average throughout all tests the 1950X is performing 44% better than the two E5-2670 CPUs, not bad at all. 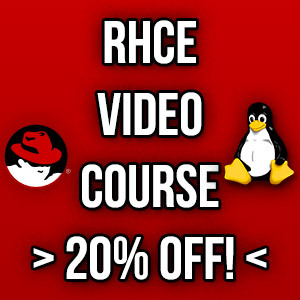 Raw performance isn’t the only important factor, what about power usage? Well it’s not so great for the older Xeons here either, drawing over 100 watts more when maxed out, and around 40 at idle, so you’ll be paying more to run the older system. Let’s talk about cost for a bit, the 1950X is currently $999 USD at the time of recording, while I saw the two E5-2670 CPUs available second hand for about $50 USD each on Ebay when I bought them, however they appear to have gone up a little in price lately due to lower supply. The cheapest Threadripper motherboard at the time of recording goes for about $339 USD, however the dual socket xeon boards even second hand can cost anywhere from $300 to $600 USD, they’re quite expensive for old used boards and can be difficult to find. I was lucky to get my CPU, RAM and motherboard for the Xeon system as combo from natex.us, so I saved some money there. Unless you can get a really cheap motherboard, I find it difficult to recommend building a dual Xeon 2670 system, as AMD’s Threadripper is a much newer platform in comparison, although this comes at an increased cost. Although the extra performance is nice to have, in multicore applications the Xeons still did a pretty good job, however the single core results are a little low making them difficult to recommend unless you’re only using them for multicore workloads. 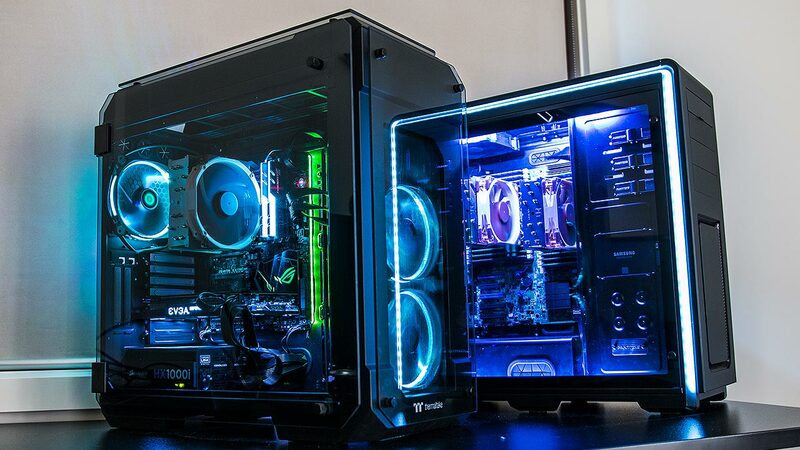 So which of these options would you pick for a home server or workstation? To be honest I don’t really have a huge need for the server anymore, as the desktop has more than enough processing power for what I do. With that said it’s good that there are still somewhat budget friendly compute options available to get heaps of cores. I don’t have any other hardware in between these two systems, so while I could test with Linux on both, I don’t have more recent Intel CPUs to test with unfortunately. How about a comparison for some heavy compiling – like e.g. compiling chrome on both or similar? Now the E5-2670 v2s can be purchased at a very reasonable price – this brings the system up to twenty cores / fourty threads, on the same motherboard as the v1’s. I have a 128GB DDR3 / twenty-core xeon workstation with two GTX 1080s that all fits inside a regular ATX form factor. The 128GB RAM, two E5 V2’s, and motherboard were each about $300, the total being about $1K, or the price of a single threadripper. I think it very cheap. I will buy it. It doesn’t make any sense to compare to this Xeon. Compare to Xeons you can acquire for $350 each used on eBay, since the threadripper is $700. For e5-2670v2 has 10 cores each and more cache, and only costs $150. As mentioned in the article, the prices were way different then. It made sense to compare them to me, because I own both, deal with it. How does it makes sense to compare a $700 CPU and system WITH WARRANTIES to used gear at the same price with no warranty? As Jarrod said, prices were very different when he wrote this article. When I bought my 2670’s they were only $75 each. AMD Ryzen 7 second gen user here, just ordered a refurbished Dell PowerEdge server on the cheap. It comes with 2 six core Xeon 5650’s, low ram but atleast it has sas raid controller and two 870watt psu’s. I really don’t think Intel fanboys should be comparing Xeon’s to Threadripper, you should focus the Xeon comparisons with EPYC which is AMD’s new enterprise grade server processor. The numbers don’t look good for Xeon vs EPYC, why should they EPYC is newer. Why would I be an “Intel fanboy” if I bought the 1950x brand new and have been using it ever since? Can someone not simply make a post about the results between the hardware they upgraded from/to in the hopes that someone else happens to find the information useful? I don’t own EPYC, if I had that, I would have done that. Great comparison, thanks very much for doing this. I have the dual Xeon setup now and was looking to upgrade as It is now 4 years since I put that workstation together. I am looking at going with the Threadripper 2950x as I am sure it would be slightly better in the numbers then the 1950x was and will definitely make my single core tasks much faster.